For as long as I can remember, I have loved books and owe this passion to my parents, who were always reading and encouraged us kids to do the same lest we grow up stupid. I don’t have children but my siblings have inspired this same love of literature in my nieces and nephews, two of whom attended the National Book Festival this past weekend in Washington, D.C. and turned in the following reports. Aline Dolinh, 11, wrote the first article and her sister Mena, 8, submitted the second one. Aline also took the photos. The National Book Festival took place on Saturday, September 26, 2009 on the National Mall, and I’d like to give you a full account of my time there, from the journey to the overpriced food. The time was well spent in my opinion, so here’s my diary of the hours I was there, covering both the “OMG!” moments and the “When will this be over?” ones. Every journey starts with small steps, and so here I go, documenting my time on the Metro with my mom and sister. After narrowly squeezing in through the doors, we were met with the annoyances of public transit. The seating was cramped and the rest of the train had no space to breathe, but luckily we were holding the Mother-with-Children card and found seats next to a rude, seat-holding stranger. I sat next to a woman who did not acknowledge me in any way as she continued to read her newspaper. The Metro had other traits that made me slightly squeamish besides the claustrophobia and impoliteness: it was basically a disease-breeding ground. Bodies were pressed up against each other with no personal space, all of the poles have probably been held by hundreds of different people, and we were all breathing each other’s air, which had a variety of body odors in it. This phase became more annoying when fewer people streamed out of the train [at each stop] than in, squishing the crowd together like sardines. I thought myself lucky for my roomy seat next to the aloof woman. When the Smithsonian stop finally came along, I knew that more walking and waiting in a crowded place awaited me, but enthusiastically got out of the packed train anyway, breathing in the underground air for about two seconds before the mob swept us along onto an escalator. We were pushed around in this way before I saw it: the first glimpse of natural light. Taking my first step on D.C. ground was incredibly refreshing. Cities are my favorite kind of place. People fanned out in all directions, giving us a comfortable berth as we eagerly made our way to our final destination: the book signing pavilions. We exited a ways from the Capitol, where the signings were, but we were determined after braving public transit and crowds to make it there. The long walk began. Organizers graciously offered us free brochures that were thick and glossy, but I was too excited to peruse them. I was actually here, I hadn’t done anything memorable yet, but I was here. But then I got annoyed when Mommy kept stopping at other tents. I understand the concept of stopping to smell the roses very well, but this was a serious matter. Rick Riordan, an author who had gained an almost cult following among my grade and had converted me as a fan to the popular Percy Jackson & the Olympians series, was here, and I was going to get my copies signed and perhaps even get a few words in. I was convinced people were devoted enough to camp out at the signing tent overnight so I insisted we keep going instead of listening to Paula Deen, who is probably a wonderful person but I didn’t really care at the time. “But the book signing isn’t supposed to start until 1:30!” Mommy said when I tugged her sleeve as an indicator to get moving. In the end, I convinced her and my sister to keep marching, and we finally found the billowy white book signing tents. I felt inclined to give a small “Hurray!” upon reaching another milestone in today’s journey. “Ha! I told you!” I pointed out when we saw the lines for Rick Riordan, whose signing had not even started yet. There were six different lines already and we moved quickly to secure a spot in the seventh one. I surveyed the crowd of fans, feeling warm and fuzzy inside that these people and I shared a common love for the same book series. Soon, my friends arrived and we formed a small Internet café under the shelter of an umbrella with our iPods and phones to pass the time. This wait period of around an hour was highly uneventful. The first real event happened when the author apparently came out, but after a short wave of cheering, it died down and the line ceased to move. It moved a little over the next hour and we heard the occasional whine of “How long now?” But we knew it was worth it, so we waited. Finally that fateful moment came when we were ushered up into the front row by organizers donning purple T-shirts. We were close enough to get pictures [of Riordan]. By now it was drizzling. I made sure to keep the camera safe and dry. After snapping several pictures, one of which was actually good, it was my turn [to meet Riordan]. I was nearly hyperventilating as I passed my book over the table and a few words were exchanged. And that was all. Two hours of waiting for a simple signature and a few seconds of conversation. It was worth it, if I must say so myself. When my friends joined me, we were squealing like obsessive tweens at a Jonas Brothers concert. Except, you know, in a less weird way. We shared our memorable experiences. “He said he liked my shirt!” said Emily, pulling out her Camp Half-Blood T-shirt. “I should have gotten a better picture!” I moaned, showing them my one good picture that was slightly out of focus. But we lived in the moment and it was raining. We ducked inside a pavilion where Kate DiCamillo was speaking. Squeezing through a large crowd, we found spots on the grass and once again whipped out our cameras. I got several good photos of her speaking, though I didn’t get any audio of her reading an excerpt from her new book. It was all a great experience, though, just to see her in person. The Tale of Despereaux, as much as they butchered the movie, is one of my favorite books. We listened to several questions before she left the stage and Rick Riordan once again came up to roars and cheers. We snapped several more pictures. I felt lucky that my memory card wasn’t full. He talked to us about the movie [Percy Jackson & the Olympians: The Lightning Thief, due in 2010] for a bit, which I rolled my eyes about. As a devoted fan, I had already looked up the whole cast and seen the trailer, which I was so afraid was going to be a disaster. When he announced his new series about Egyptian gods, though, I stopped breathing. Please let me have memory left, I prayed frantically. I pulled out my camera one last time to record and pressed the button. To my surprise, it recorded the whole thing. Yes, I said to myself. We decided to get out of the place now, as the rain seemed to have stopped, and we were all hungry. I knew the food would be overpriced to trap tourists, but I didn’t care. I was hungry. And the fries looked so good, I didn’t care if they were four bucks. We forked over money and ate ravenously. Before I knew it, all was gone and we were heading home. The exhilaration I had felt earlier seemed so far away, though I felt good that I had brought home some memories of it. My name is Mena and I am eight. I am in 3rd grade GT and I have started reading longer books. My sister Aline and I both like Rick Riordan. When my mom told me we would go to the National Book Festival in Washington D.C. to get our books signed by our favorite authors, I got really excited. I wanted to get my book The Titan’s Curse signed by Rick Riordan. I like his books because they are humorous and have lots of Greek mythology in them. My favorite story is how Hercules tricked the Cyclops. This story is actually in The Sea of Monsters. Before I came across Rick Riordan, my favorite author was Kate DiCamillo. Actually, I still like her a lot. I love her first book Because of Winn-Dixie. I read it when I was 7. Mom let us skip our Saturday piano lesson so we could take the train into Washington for the Book Festival. My dad and my younger brother Max stayed home that day. My dad was sorta not feeling well and Max, well, he only gets excited about cars, computer games and stuff. He said he was afraid that it would be long and boring. So it was a day trip for me, Mom and Aline. I like riding the Metro train and seeing all the cars whizzing by on the freeway from our train’s window. Mom said the train is not that fast, but there are no stop signs and no stop and go like you are in the car so it just seems faster. I think Mom wants to live closer to the city. She drives fast and she doesn’t like slow drivers. She wishes she has magic spells so she can make big slow cars turn into tiny toy cars and leave them way behind. It was crowded in the Metro train. The worst thing was the squishy crowd. The best thing was sitting on Mommy’s lap. I was afraid I wouldn’t be able to get out at our stop and one of us would be left inside the Metro. Well, we finally met up with our friends and their mom on the Mall. I was happy to see my friend, Helen. She is eight like me and she is the younger sister of Emily, Aline’s friend. Aline, Emily and Dana can be silly when they get together. They kept wandering off without paying attention to where the adults were. I did not mind that we waited nearly 2 hours to get our books signed by Rick Riordan. My most favorite thing was standing in line and playing with Aline’s iPod and watching iCarly on Emily’s mom’s phone under the umbrella. We sat on the ground under the umbrella because it was sort of raining and cold, but it was cozy underneath with all the girls. After we got our books signed, we went into a tent where we listened to Kate DiCamilo and Rick Riordan read their books and talk to their fans. They had lots of adult fans, too, who did not want to leave their seats so we had to sit on the grass in the big white tent. The ground was wet so I got to sit on Mommy’s lap again. We met a woman who wore a black T-shirt with a pink pig. She told everyone she was E.B. White’s great niece. When Kate DiCamillo came out she looked just like what I thought she would look because I saw her picture online when I did a paper on her last year for my Brownies troop, but in some way she looked different too. In her online photo she had more highlights mixed with dark brown hair. But I liked her when I saw her. I think she looked prettier in real life. Kate told funny stories from the beginning to end, but Rick didn’t tell funny stories, it’s more like how he talks that’s funny. Kate DiCamillo told people she used to work at Disney World, where she wore a powder-blue spacesuit and told people to “watch their step.” She became a writer because she stunk at everything else. She told people she wrote Because of Winn Dixie because she was in Minneapolis one winter and it was so cold she wanted to think of some place warm so she set the story in Florida, where she came from. She wanted a dog so bad in Minneapolis but she had no dog so she put him in the story. She also explained how she wrote [The Miraculous Journey of] Edward Tulane. One year she got a giant spooky rabbit as a present for Christmas. The rabbit was dressed really fancy, but one night she had a dream that it was completely naked and lying face down in the water. She wanted to write about how the rabbit got there and it became Edward Tulane. But she said now she is not scared of that spooky rabbit any more because it helped her write the story. I like both Kate DiCamillo and Rick Riordan. They were both interesting. I would come back next year. It depends on which books I read next year that I like, then I will see the authors. This so cool. 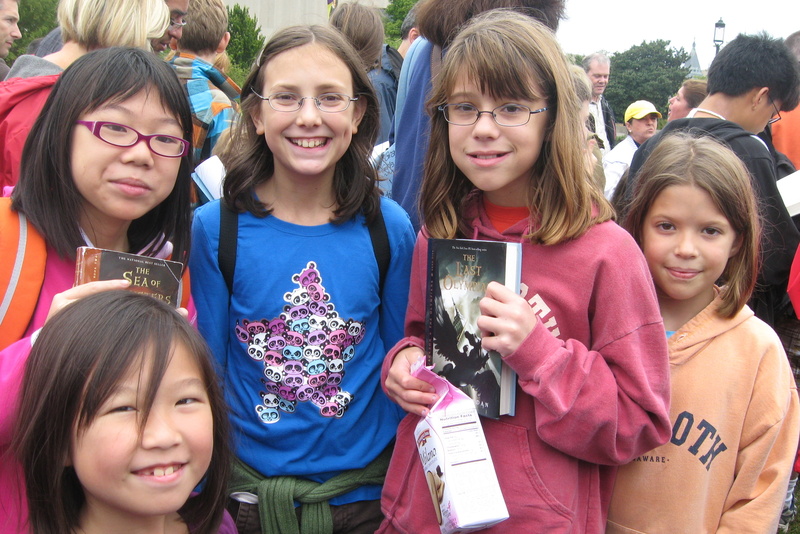 I never thought of what it must be like to attend a book festival from a kid’s point of view. I was also blown away by how grown up an an eleven and eight year old could sound. Honestly, I usually just push the children out of the way whenever I attend one of these festivals. I don’t take them seriously at all. Nice to know there are very thoughtful young minds who like to read. Usually, I just see the crazy ones at the Harry Potter book releases, but these two express themselves really well. I would like to read another post by them sometime. I was blown away by these reports, too, and I know them! I don’t doubt kids’ intelligence but I might’ve pushed a few aside at Harry Potter parties to get to my books :-D.
Thank you, Aline and Mena, for your thoroughly entertaining accounts of the Book Festival through your eyes. I felt like I was there with you. Thanks, Shell. Yes, the nerd gene runs deep in our family and we’re proud of it! Cute. Do they review movies as well? That’s an excellent idea, EIREGO. These are their very first blog posts (I’m so proud they chose my blog to make their debut; what are the chances?) but maybe I can convince them to review movies, too. They’re avid moviegoers. I know they liked Cloudy with a Chance of Meatballs and are looking forward to Where the Wild Things Are. I’m glad they had a good time, but more importantly, that kids their age actually like to read. I agree. I’m chagrined when I meet children who only like to watch TV or play video games. Great reviews! (It’s hard to believe the first one was written by such a young writer, but KUDOS!) Wish I could have been there, but alas I have too many responsibilities…plus live more than like a thousand miles from the location it held. It will surely be a memory to cherish for years to come! Happy reading! Aline e-mailed me her story without showing it to her mother first. My sister had wanted to see it beforehand but Aline said she’d have to read it on the blog like everybody else. That piece was truly all her, without any adult influence! Excellent reviews ladies! I didn’t get to attend the festival this year, so it was exciting hearing about it from you. I’m so happy that you enjoy reading and meeting the authors. Keep up the good work! Jen, thanks for the encouragement. Bummer you didn’t get to go this year. I guess you’ll just have to settle for Bouchercon ;-). That was a great pair of reviews and experiences at this festival. Of course, realizing both of PCN’s nieces can write so much than myself is a bit of a downer ;-). I hope you’ll have more dispatches from them in the future, PCN. These were wonderfully done. Thanks. Thanks, lp13, but your assessment of your writing skills is grossly inaccurate. You write beautifully and I don’t want to hear any arguments about it. Case closed. Aline and Mena, Terrific reports! Well-written and entertaining! Maybe you could do some book and/or movie reviews next time. Thank you! Aline and Mena: I’m jealous I didn’t get to go. It sounded like a great event. And your reports are excellent!!! will you please make a transformers book?